This casserole tastes just like Twice Baked Potatoes, but it’s so much easier to make. No stuffing potato skins here! This can be served as a main dish or a side dish. Boil potatoes until tender, about 15 minutes. Drain and place in a large bowl. Add sour cream, milk, butter, salt and pepper. Blend with an electric mixer until smooth. Stir in 2 cups cheese, bacon and onions. 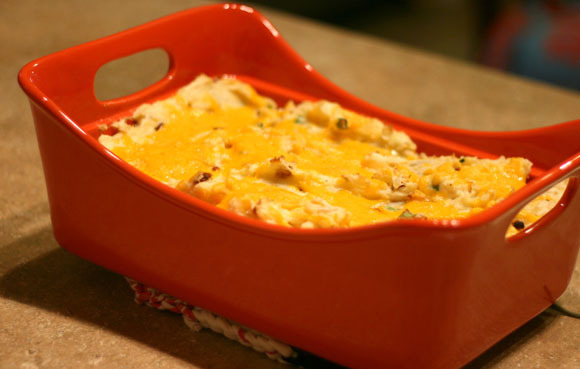 Spread into a casserole dish and top with remaining cheese. Bake for 30 minutes.